These guided hikes go to the painting sites of the 19th-century artist Thomas Cole and his contemporaries including Frederic Church, Jasper Cropsey, Sanford Gifford, and Asher B. Durand. Participants will be able to see the same views that appear in famous landscape paintings. The 19th-century artists hiked, sketched and painted in the region surrounding Thomas Cole’s home in Catskill and Frederic Church’s home, Olana, as well as sites throughout the Hudson Valley and beyond. Many of these views are spectacularly preserved and offer a dramatic window into the past. 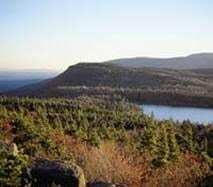 All hikes depart at 9 am from the visitor center of the Thomas Cole National Historic Site at 218 Spring Street in Catskill, New York. These hikes frequently sell out and reservations must be made in advance by visiting www.thomascole.org/current-events and clicking on the link to the reservation form. The Thomas Cole site also recently announce that eight of the Art Trail sites have newly installed “rubbing medallions” – metal plaques with a raised design that can be “rubbed” using a pencil and a piece of paper, generating a unique keepsake. Come to the visitor center at the Thomas Cole site for Complete information and to purchase an Art Trail Passport that contains blank pages and a soft pencil suitable for making rubbings. 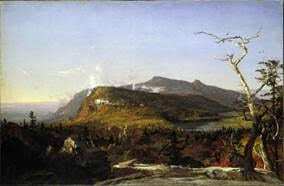 More information about the Hudson River School Art Trail can be found at www.hudsonriverschool.org. The Thomas Cole National Historic Site is a non-profit organization that preserves and interprets the home and studios of Thomas Cole, the founder of the Hudson River School of painting, the nation’s first art movement. The Main House and Old Studio are open from May through October and Tuesday through Sunday. Lectures and other programs take place throughout the year. From the north or south, take NYS Thruway (87) to Exit 21. After toll booth make a left and proceed straight ahead for two miles until it becomes Main Street, Catskill. Make a left at the traffic light onto Bridge Street, and after two blocks make a left onto Spring Street (Route 385). The Thomas Cole site and parking area are five blocks down on the right. Illustrations: The same view as seen in 1855 and in 2005. Above, a view from Art Trail site #7; and below the same view by Jasper Cropsey, Catskill Mountain House, 1855.